In what is surely set to be the most bizarre story MobileSyrup will publish this week, Toronto-based theScore, a sports-focused publication, has released what seems to be a promotional game called Race 2 PyeongChang. In the game, players take control of three characters named ‘Don,’ ‘Vlad’ and Kim,’ avatars that share a striking resemblance to U.S. President Donald Trump, Russian President Vladimir Putin and North Korea’s supreme ruler, Kim Jong-un. 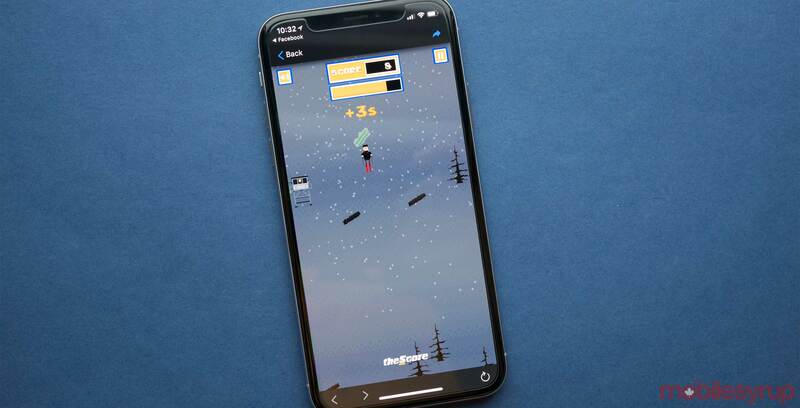 The game, which is available in theScore app’s ‘Discover’ section, allows fans to take control of three characters, with the goal of getting them down the ski slope as fast as possible by collecting power-ups and dodging obstacles. “Race 2 PyeongChang is not only a ridiculously addictive mobile game, it also offers a fun and playful twist on our already incredible coverage of the Winter Games,” said John Levy, CEO of theScore, in a press statement. The game plays like a standard classic top down skiing title in the same vein as Skiing Yeti Mountain of Ski Safari, complete with retro pixelated visuals. Race 2 PyeongChang also features clever real life references, such as ‘The Don’ requiring users to “collect tweets” in order to continue moving, or Kim needing “uranium” in order to progress. In the case of Putin — I mean, Vlad — needs to collect “clean urine” in order to progress. The game is available in theScore’s Android and iOS app under the ‘Discover’ section.